Rosie and I have spent the morning in the garden getting the soil ready for some more planting. I used the hoe, Rosie used her paws. All the while next door’s tortoise-shell cat sat on top of the high wooden fence giving me the evil eye as she seethed over my blatant favouritism: So when the puppy digs in your garden, it’s cute . But I sleep on your sorrel and it’s a hanging offence? Pah! My courgette plants (which are too awkward to be slept upon) are doing particularly well. I’d say I have a glut of courgettes but “glut” is such an ugly word, implying I’m unhappy about the situation. I’m really not! Perhaps “abundance” would be better. Yes, abundance. I have an abundance of courgettes. Courgettes which will turn into marrows in no time at all if I don’t keep picking them. A glut of marrows would not be a good thing as there is only so much you can do with such bland, watery vegetables. So I’m on a mission to eat a lot of courgettes this week. My usual use of courgettes (and D’s favourite) would be to slice them length ways, drizzle with olive oil and griddle until stripey. Delicious but there is only so much griddling a girl can take. Sophie at Mostly Eating shared a beautiful recipe for courgette, lemon and goat’s cheese pasta. I’ve made that several times in the last month. Can’t get enough of it. And then we have the next three recipes. I made each for the first time this week and each was delightful in its own way. Think I might add breadcrumbs to the onion paste next time I make this. More cripsy bits! Whizz the onion, garlic, spices and a good drizzle of olive oil in a food processor until it creates a paste. Season well. Place courgette sticks in an oven proof dish and coat with the paste. Cover and bake in a pre-heated oven at 190oC for 20 minutes. Uncover, baste courgettes and bake for another 15 minutes until golden. Inspired by Elizabeth David’s recipe in Summer Cooking this is not a light dish. It’s oily and salty and absolutely divine. Fry the bacon in the olive oil over a low heat until it renders most of its fat. Remove bacon from the pan with a slotted spoon and set aside. Increase the heat slightly and fry the courgettes for 5 mins stirring frequently to stop them from sticking to the pan. 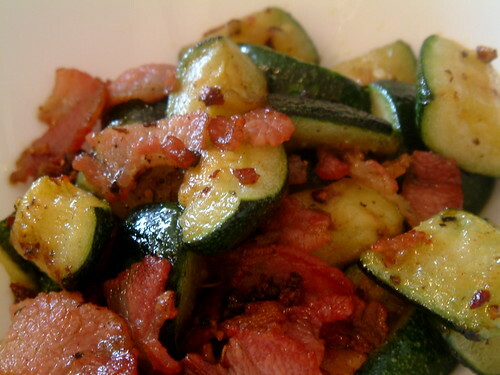 Add the bacon to the pan and continue to fry over a medium heat until the bacon crisps up and the courgettes turn golden. This was pure experiment. Was extremely happy with the results. Soften the onion and garlic in a little olive oil. Stir in the tomato puree and the quinoa. Add the water and bring to the boil. Cover the pan and reduce the heat slightly. Simmer for 15 mins or until the quinoa has absorbed all of the water. Fluff up the cooked quinoa and stir in the tomato, basil and parsley. Season carefully. 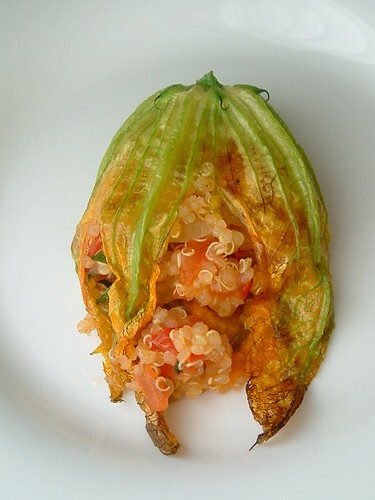 Pull back the petals of the courgette flowers and fill with the quinoa mixture. Close the petals. Place stuffed flowers in a heat proof dish. Brush flowers lightly with olive oil and place under a medium grill for 5-8 mins or until the flowers get a little crispy around the edges. I went to the farmer’s market last weekend looking for the flowers but they had only the courgettes without the flowers. Looks pretty. Much as I love cats, they never actually help, do they? Dogs are always willing participants. Ah, you’re making me envious of your bounty and your lush, warm weather. Love the Moroccan idea and the quinoa stuffing. Did you end up getting a new camera after all? Photos are gorgeous. Another del.ici.ous tag! Thank you! When can I come for dinner! I will bring the wine!!! Rosie’s not going to want to go home! What a good girl! She has such an expressive face. Our neighbors across the hall have a 9 week old puppy, and I can’t contain myself whenever we’re in the elevator together. Those recipes are gorgeous – are you in the mood for soup? Sauteed with garlic and onions until soft and then zipped in the food processor with some chicken stock could be good. Maybe some herbs and then some cheese on top? I’ve been working on something similar with other squash. Perfect! 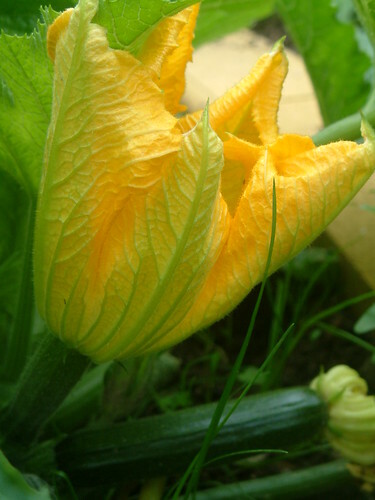 I adore the picture of the squash blossom. 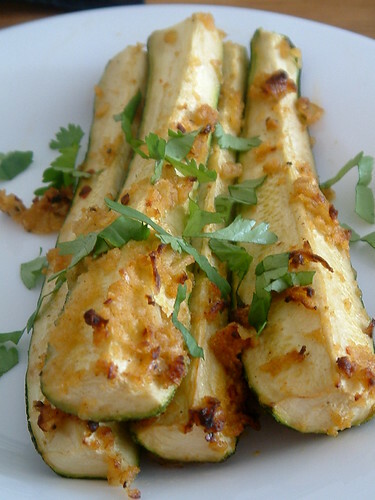 I like zucchini, but know little about how to cook it in different ways. your recipes are great start! Rose – The flowers wilt so quickly when picked. Perhaps that’s why they are hard to find at markets. Lucy – It’s actually pretty cold here just now! Hasn’t got above 14oC over the last few days. 😦 Trying to be positive and go outside lots anyway. My camera is playing nice at the moment so I haven’t got a new one yet. Thank you for the kind compliment. Chris – Lovely to hear that! Deb – Anytime! And I might just try that bread today! Figs Olives Wine – I’m the same with dogs everywhere! Am most definitely in the mood for soup. It’s cold over here. No summer for us this year. Anh – Thank you! Hope you enjoy the recipes. I have never tried courgette flowers, Wendy, and this looks so good! The Moroccan Spiced Courgettes are mouthwatering, too. I tried your pea and feta soup yesterday. Mmmmmn! The hubby had 2 bowls of it, I loved it and my baby girl too and believe me she rarely likes pea soup. Next time I will add more basil, as I love the freshness of it with the peas. Other than that the soup was great. The adding of feta gives it a lot of flavor. I will be posting about it next week and about the few things that I added to it just because I like to experiment recipes. Until then, thank you very much Wendy for the recipe. It’s a simple yet very satisfying soup. Lucky lucky you that you can eat zucchini flowers! That is the real beauty of having your own garden! delicious! Have you every had them fried? They are very delicious! Patricia – This season is the first time I’ve eaten them and only because I’m growing them. They are great raw as well. Rose – I’m so glad!!! 🙂 Look forward to reading the post. JennDZ – I haven’t had them fried yet. But I will! Love the photo of Rosie amongst the plants! I love all 3! And all 3 are new, which, as ‘courgettes R us’, too is very welcome! 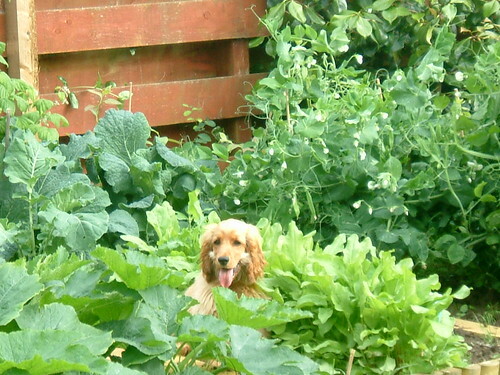 I have, with great effort, taught my dogs not to walk in the garden. They carefully tiptoe around the edges and never touch paw to dirt…until the odd rabbit breaks for cover…. Then there’s a bit of barking and yelling…. Maninas – Me too. Who could be angry at that face? KatieZ – Very glad. Impressed by your considerate/well-trained dogs! I’m really pleased you tried out my courgette pasta recipe and enjoyed it Wendy! I’m just back from Spain where we had marvellous courgette flowers stuffed with oozing hot, mozzarella – might be another one to try?